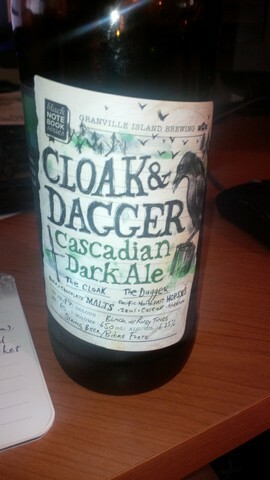 From Granville Island Brewing comes their new “Cloak & Dagger Cascadian Dark Ale” a great new addition to the CDA or Black IPA landscape. 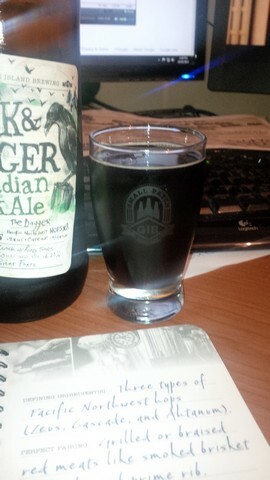 The CDA pours a deep black with some minor ruby tones and a good off white head. The aroma consists of roasted malts, burnt coffee, mild chocolate, grapefruit, pine and an overall floral hops. The flavour was full of malts including roasted malts and burnt coffee and a minor hint of chocolate that was beautifully balanced by a fairly big hops bitterness, pine and an overall citrus/grapefruit taste. This brew is quite dry with a sharp flavour. The strong malts and the strong hops flavours did a very good job of complimenting each other! The alcohol content of the “Cloak & Dagger” is 6.25% and the IBU is 60 so even if you don’t like hops bombs of IPA’s you should enjoy this brew. This is one of my favorite CDA’s that I have had up until this point. Great job Vern and everyone over at Granville Island Brewing! 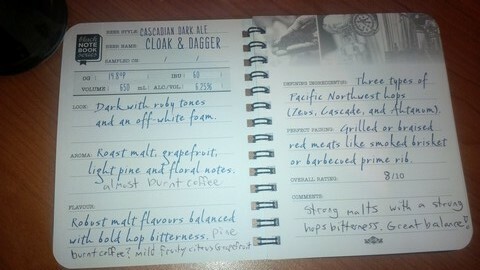 Commercial Description: Under the cover of malty darkness, mighty hops are poised to attack. It’s a mysterious blend of flavours that could only come from Cascadia. 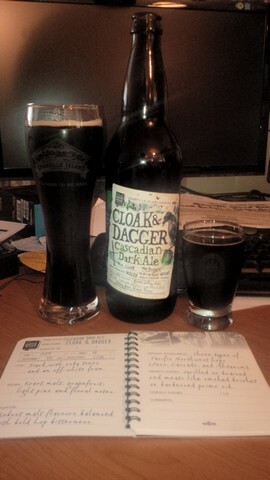 This beer was hand-crafted at the taproom on Granville Island using a revipe straight from the notebook of our Brewmaster, Vern Lambourne. Food Paring as per Granville Island Brewing: Grilled or braised red meats like smoked brisket or barbecued prime rib. 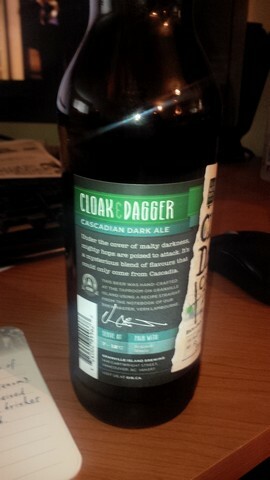 This entry was posted in Cascadian Dark Ale (CDA) and tagged bc, beer, bitter, bitterness, burnt coffee, canada, cascadian dark ale, cda, chocolate, citrus, coffee, granvilel island, granville island brewing, grapefruit, hops, hopy, malt, malts, malty, pine, roasted malt, roasted malts, roasty malt, roasty malts, sharp, vancouver, vern.